It’s not the easiest task to bring together Flushing’s burgeoning and diverse business community. With so many different characters, cultures and languages, even communication can be a difficult thing to navigate. For the last two years, that unenviable role has belonged to John Choe, executive director of the Greater Flushing Chamber of Commerce, which launched in 2014. Whether it’s informing business owners about city rules and regulations, organizing night markets, or figuring out how to clean up the neighborhood’s ongoing trash problems, Choe has played an outsized role in the community’s happenings. 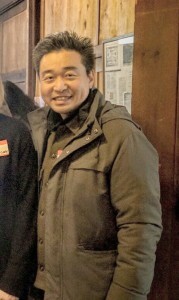 Choe, who was born in South Korea and lived in Australia until he was 15, first moved with his family to Staten Island, where he attended Susan E. Wagner High School. He studied history at SUNY Binghamton, was awarded the prestigious Woodrow Wilson fellowship in public affairs and international relations, and received his master’s degree in public policy from the University of Chicago. After winning even more fellowships and working at multiple city agencies, Choe found himself working for then-Councilman John Liu as his chief of staff. When Liu was elected city comptroller in 2009, Choe was appointed his policy director after a failed bid to replace his boss in the City Council. Choe has since returned to serve the greater Flushing community. He took an active part in the now-abandoned Flushing West redevelopment, created a lending circle program to help local entrepreneurs, and started seminars and workshops for small business owners. 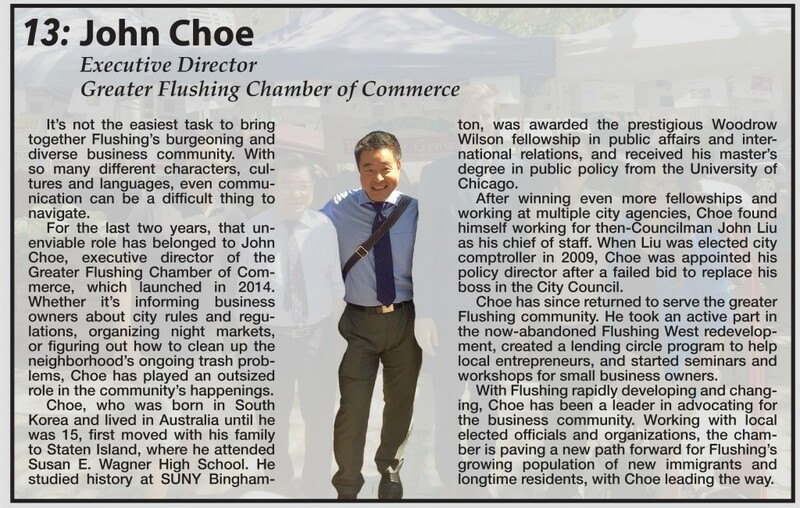 With Flushing rapidly developing and changing, Choe has been a leader in advocating for the business community. Working with local elected officials and organizations, the chamber is paving a new path forward for Flushing’s growing population of new immigrants and longtime residents, with Choe leading the way.